What is Meant by Facing in Retail Stores? What Does Facing Mean in Retail? Stores use the term facing to describe the act of straightening merchandise. 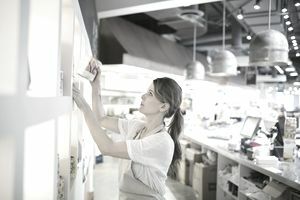 A clean store is inviting to customers, helps them find what they want and is ultimately better for sales. Facing should be done daily (if not throughout the day) to ensure the store is kept tidy for shoppers. Facing goes by a number of names - blocking, conditioning, fronting, recovery, straightening and zoning - depending on the store. All of these words have the same purpose: ensuring that the store is ready for customers. However, facing also has two meanings as it can be used as both a noun and a verb. Facing as a Noun: The number of identical products (or same SKUs) on a shelf turned out toward the customer. For example, a planogram may call for a popular brand of tomato soup to have a facing of five cans while the generic brand may only have a facing of two cans. It gives more attention to the higher priced item. Facing as a Verb: The act of pulling each product to the front edge of a shelf with the label turned forward. For instance: "... cashiers are asked to begin facing product when we start to slow down for the night." Clothing stores will often use the words zoning or recovery rather than facing. Facing is commonly used by grocers, drug and convenience stores as well as many department stores because they have more shelf product. Facing is all about making the store look great. It is one of the keys to a great shopping experience and should be considered part of your customer service because it is a service. Customers do not want to work hard when they're shopping. They shouldn't have to dig through piles of shirts to find their size. Those shirts should be folded neatly and in order by size as well as color. They don't want to reach to the back of the shelf to pick up their brand of toothpaste. That tube should be right at the front edge, waiting for a buyer. By straightening your merchandise, you make it easier for customers to find what they're looking for. They can also compare products easier if they're in a nice, neat row. It also gives the store an appearance of being full of merchandise. There's a certain psychology to giving the illusion of prosperity and orderliness that does wonders for retail sales. Even if the shelf is not full behind that first row of product, it looks as if it's fully stocked. Tip: The same can be said for clothing hanging on a rack. If a bar is not full, evenly distribute hangers across it and concentrate a few more toward the front. It gives the illusion that the rack is fuller than it is in reality. When and how should facing be done? Every store should be as tidy as possible at all times. That means that employees and managers should pick up, relocate or straighten merchandise whenever they have a moment to spare. The adage "if you have time to lean, you have time to clean," can apply to straightening product. Floor employees of department stores are asked to make facing a regular part of their shift. Merchandising is their primary task after customer service. Many stores will have cashiers help straighten merchandise during slow times. Most stores will ask their closing crew to begin 'recovery' a little before closing time and stay until the store is ready for the next day's business. After really busy days, employees who open the next day may be asked to finish zoning. Straightening is no more complicated than putting everything back in its proper place. Some days, like those crazy holiday sales, will require a lot more work and you may need to schedule extra staff just to straighten merchandise throughout the day. When doing the daily recovery, many managers find that teams work best. If one department was annihilated by customers, everyone might gang up on that section to whip it back into shape rather than leave one person to feel overwhelmed. Clothing should be folded or placed back on hangers and returned to racks or shelves. Floor models should be organized and front-facing and boxes placed at the front of the shelf. Merchandise on shelves should be at the front edge, nicely stacked and with the label facing out. There should be no holes. Products that are out of place (dropped by the customer who changed their mind) should be collected and returned to the proper department, aisle or shelf at the end of recovery.